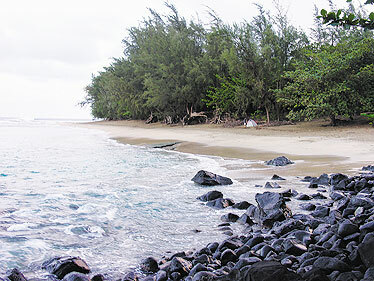 Kee Beach at the end of the road on Kauai's North Shore is undergoing a face lift thanks to the state. HAENA, Kauai » Kee Beach, at the end of the road on Kauai's North Shore, has been, for decades, at the end of the list when it comes to upkeep. But that is changing, with new bathrooms being constructed and a new lifeguard tower scheduled to go up later this year. The state has also started working on a comprehensive master plan for the area. Kee Beach, which is part of Haena State Park, is the third most frequented state park in Hawaii, getting more than 700,000 visitors last year, according to the Hawaii Tourism Authority. It is a great spot for snorkeling and searching for shells, and it acts as the gateway to the Na Pali Coast. The trail head for the Na Pali Coast is just a few dozen feet from the sand. For years, however, huge potholes, the lack of a parking area, disgusting bathrooms and other problems have plagued the area, also the site of the historic Taylor Camp hippie commune in the 1960s and 1970s. The calm-looking lagoon and dangerous outer reef also have led to almost a dozen drownings since 1970, according to county statistics. "I think we can all agree that Kee receives more visitors than it is equipped to receive, so additional maintenance is imperative," said Beth Tokioka, director of the Kauai Office of Economic Development. The work has started: The Department of Transportation fixed the road in 2006, and the state Department of Land and Natural Resources has started a project to replace the bathrooms, with work scheduled to be completed in June. When the DLNR began looking to replace the bathrooms in 2006, a number of Kauai residents expressed concern that any new system would disrupt burials that are concentrated in the area. To alleviate their concerns, the DLNR is designing an alternative waste-water treatment system, scheduled for construction next year, to mitigate the impacts of the leach-field system currently in place, said DLNR spokeswoman Deborah Ward. Kee also will be the first state beach on Kauai with county lifeguards. The state came up with funding and a liability agreement, approved by the County Council last month, to have four new lifeguards, an all-terrain vehicle and a tower for the area. "Being able to establish lifeguard service there is very important as well, and we're happy to see that state-county partnership finally come to fruition," Tokioka added. Other changes might also be coming to the park, as the state has hired a consultant to prepare a master plan and an environmental impact statement for the area, Ward said. Once the contract is executed, she added, studies will be conducted to inventory the park and its resources, and public information hearings will be held to discuss the park's future. "The plan's objective is to balance park usage with resource protection and sustainability," Ward added.